Relax. This has nothing to do with bulimia or food poisoning... it was a purge of a different sort. Although at times I DID feel nauseous. And achy. And tired. Yes, this was a purge of a materialistic kind. 8! Eight bursting recycling bins. 26! Twenty-six bags and boxes for Goodwill. 38! Thirty-eight bags of garbage! Yes, that's what it took for me to shovel clean out the disaster area formally known as "The Basement". After years of procrastination, it's done. I can now walk through my Star Wars collection without hurdling the Easter decorations. I can actually open the dryer door in the laundry room. And no carboard boxes are growing mold or providing low-rental housing for scary spiders. It's a miracle, I tell ya. I even got out the paper shredder I bought two years ago (well, I had to FIND it first)... and had a party shredding Very Important Papers such as income tax forms from 1975. Why the heck I thought I needed to keep every frickin fuel bill, birthday card, receipt and instruction booklet that has ever weaseled it's way into our home, I have not the slightest idea. And I can get back to way more important things like blogging, reading blogs and thanking all the nice bloggers for awards I obviously don't deserve. Oh boy I bet you feel great now! Yay! I gotta do that here now. I've moved a lot in the past few years so each time I've down sized. But it's amazing how much you can gather! I guess the whole idea of spring cleaning really does make sense! You know that Atari catalog will easily get you a $1000 on Ebay, don't you? It's a veritable collectors item. What be.bart said! I hope you didn't throw that out with the trash. Always check the desirability of 80's game console items before chucking them out!! LOL! Drowsey: It feels great. I keep going down there, looking around... since we've been here for 21 years, I had a LOT of crap, er stuff to chuck out. Be.Bart: Well, maybe not $1,000, but I will admit I kept it. One of the few survivors of the purge. Wow! That's a lot of rubbish...er...I mean... stuff you cleared out! Bad News....the Atari Video Game Catalog is going for about $300 on ebay these days. Congrats on the cleaning. It is a liberating thing, when it is all over. I know dozens of people that need to do the same things, but they are too lazy. oh sweet! I am constantly trying to purge my house - but it seems never ending! I'm glad to hear it's possible to finish it! Any chance you would drive down to Connecticut and help me purge both the basement AND the black hole above us, also known as the attic? Babs: It sure was! Now the bags and boxes are out on my driveway; Goodwill is supposed to be picking them up today... gad I hope so. My neighbors must think I am daft (especially since tonight I am dragging out all the garbage bags to the curb for pickup tomorrow). Babs: Heh, heh, thanks. As I was writing, his voice popped into my head as I was counting, so I HAD to include him! Lotus07: Aw, crap, only $300? Well, I might as well hang on to it then. I swear it felt like I was on one of those "House Cleaning" shows on HGTV. Everything was sorted into three piles; one for garbage, one for Goodwill, one to keep. But at least I saved myself the embarassment of showing the world what the 'before' pictures looked like. Fancy Schmancy: Hah! Although I'd love to visit, there is no way in hell I want to do that again... at least not until 2020 when I will get around to it next... ;) Thank goodness there is nothing but insulation in our attic; I think I would have a heart attack if we had more crap up there. But it feels great to see the end results, doesn't it? I love being organized! 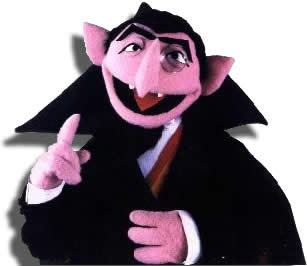 Is the Count still haunting you? I love to purge the house every now and then. Right now my garage is a disaster area. Congratulations on getting that huge job done! Now, I bet you feel better. I would like you to leave about 3 hours earlier on your trip this weekend so you can stop by here and clean out my storage room too. You have now proven you have the experience to do it. Thanks Maureen, that will help a lot! Wow, that's impressive. We have a whole barn that we need to clean out... some day. That Atari catalog has got to be the most 1982 thing I've ever seen, if that makes any sense. Darla: Yeah I have! But you are right; it does feel good… and the Count finally took the hint, turned into a bat and flew off when I pulled out the garlic, wooden stake and crucifix. JoJo: I wish hubby would do the garage too… I do enough to be able to walk through it, but he really needs to trash a lot of his own crap, er stuff. VE: Only YOU would notice that! I had to go back and take another look… I see what you mean! What is this, the Village People? Karen: Thanks! I do. And now I hope I have learned to stop collecting trash and saying “yes” to relatives who want to give us stuff from THEIR purges! Jeff: Har!!! Don’t hold yer breath, there. I am looking forward to a hotel and room service next week. Someone ELSE can clean up after me for a change!!!! Diesel: OMG I am so glad we don’t have a barn; we have a yard big enough for one but thank the gods we don’t or else it would be another repository for crapola of humongous proportions. Ha! You are so right about the catalog… reminds me of Sesame Street or the Electric Company too. Toners: Well, although I would LOVE to go to beautiful Colorado again, I’m afraid I’ve had enough of cleaning for awhile… unless HGTV wants to hire me as the Canadian equivalent to those two British ladies that disinfect people’s houses. Er, maybe not. Some of those are way too gross. Peggy: Yikes! Don’t SAY that!!! I tell you, I had to be in just the right mood to do this. I couldn’t let myself get sentimental or clingy, thinking “one day I just might use this… whatever the hell it is…” I just tossed and refuse to let myself regret it. Maureen, you are GOOD!!! OMG, we have so much to purge downstairs. I hate going down there, it just taunts me, all the time! Purges like that always make me feel very successful. 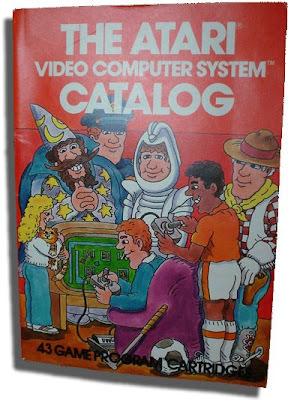 Oh and that Atari brochure looks like they stole the charcaters from School House Rock! Oh I love that feeling of cleaning up...it must be huge weight off your shoulders. Love that catalog though...that might be worth something.